Riding a motorcycle is an exercise in responsibility—to yourself, to others, to the environment and to the sport. So remember, wear a helmet, eye protection and protective clothing whenever you ride. Never ride under the influence of drugs or alcohol. Inspect your motorcycle before riding, read your owner's manual, and see your local Honda Dealer concerning reimbursement through the Honda Rider's Club of America for Motorcycle Safety Foundation rider training. Honda CRF450R, CRF250R and CR models are designed exclusively for off-road operator-only use in organized, closed-course racing events. Always obey local laws, use common sense and remember, Honda's XR650R, CRF450X, CRF250X, CRF230F, CRF150F, CRF100F, CRF80F, CRF70F and CRF50F are designed exclusively for off-road operator-only use. Parents need to consider their youngster's age, size, ability and maturity before allowing them to ride. Make sure you have a proper license when riding the XR650L on public roads, and always obtain written permission before riding on private land. Never use the street as a racetrack. Whenever you ride off-road, follow the "Tread Lightly" guidelines, and always keep on established trails in approved riding areas. Use common sense, keep your riding area clean, respect the rights of others when you ride, and never modify your motorcycle's silencer, exhaust system or spark arrestor. Click here for more information about HONDA Rider Education. 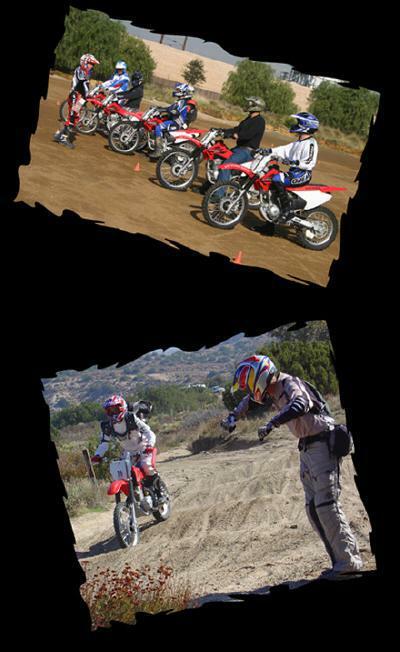 Click here to learn about the MSF's new Dirtbike School. Click here to find an ATV safety training course near you.